BOOK REVIEW: All the Wrong Questions: "Who Could That Be at This Hour?" Lemony Snicket, and his, well, representative, Daniel Handler, is probably my favorite modern author. From the gateway drug into black comedy that was his "Series of Unfortunate Events," to the equally funny-as-it-is disturbing full on dark comedy onslaught that is "The Basic Eight" (and also yeah, where my band currently draws its name from), his ability to wring laughter in the bleakest of situations and capture a variety of narrative voices has always attracted me, and now, almost 6 years to the date of the last book in the series, "The End," Handler returns to Snicket's world with the "All The Wrong Questions" series, starting with the first volume, "Who Could That Be at This Hour?". 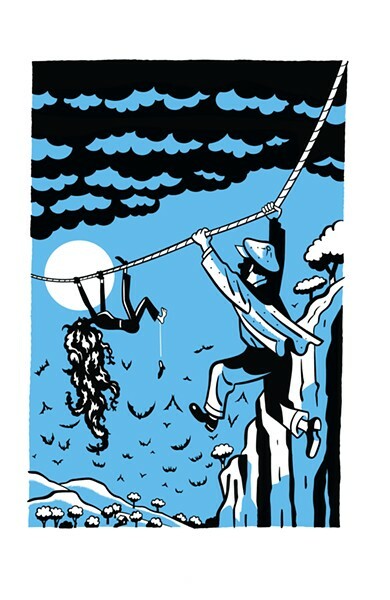 While we could spend endless hours debating the ending to the 13 volume "Series of Unfortunate Events," Snicket has instead gone back in time, in the first 'authorized' autobiography of his childhood, and the dark, dreary narrator is replaced with a sharp, sarcastic, and almost sunny (at least comparatively) narrator, fresh off his training with a secret organization that is never named, but we can all guess what it is. Handler's had time to hone and polish the Snicket voice, and it's strong as ever, even though it is a little odd to see it getting younger, not older, with time. It's unclear if the book is presented as older Snicket rewriting his diary (a technique Handler is familiar with a la "The Basic Eight"), or if it's his unaltered telling of the events with no knowledge of the future (The world of the Baudelaire orphans is never even mentioned). Several of his typical tropes, a word here which means his various story telling devices, including the one just used here, return, and "Who Could That Be at This Hour" is nothing if not full of Snicket's tongue-in-cheek brand of humor. Fans looking for an inside look into the secrets of the organization known was V.F.D. might be a little disappointed: The agency is never even mentioned by name, though is seems fairly clear that Snicket has completed his initial training and is now on an apprenticeship with the worst mentor possible in hopes of conducting his own secret work on the side. We get brief mentions of Snicket's V.F.D. training, but fans looking for a tell-all are going to find needle-in-the-haystack pacing to the revelations they may have been waiting for. Unlike the "Series of Unfortunate Events," "Who Could That Be at This Hour" lacks some of the doom and gloom, which is slightly disappointing, but I'm also older than I was when the series started back in 1999 (I was nine...), and the book aimed at those a little younger than myself. The book is still enjoyable to the older fans who grew up with the books, but there's no doubt this is a younger and still somewhat starry eyed Snicket, fresh off of training and still hoping to make a difference in the world. It also lacks a central antagonist figure that even comes close to the terror that was Count Olaf, and Snicket just isn't as world-worn and dreary yet, but we can start to see how he became that way. 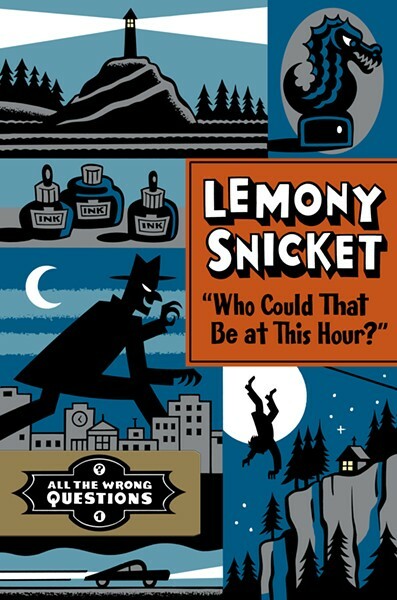 Lemony Snicket's "Who Could That Be at This Hour?" chronicles the author's teen years, and boasts a new art style as well. While things are a little less dreary they are still full of Snicket's wonderful turn-of-phrases, wit, and biting sarcasm. No longer simply the narrator, we get closer to Snicket's mysterious personality than ever. Snicket's love for the good things in life: Libraries, fair journalists, friendly debate, and good solid quiet time to read, are as clear as ever, as are the ever-so-apparent mistrust of adults (who never seem to get it right anyways). It spoke to me years ago in the first series, and though I've gotten older, there's still something to be said about a headstrong teenager being able to solve mysteries in ways that adults couldn't, just the same problem that the Baudelaire's will have coming up in their own story. The ending left a lot to be desired and felt like it dropped off just because Snicket had hit that magical Chapter 13: The whole plot was weakly resolved in favor of revealing that Snicket, in case you couldn't guess it, was really up to more than meets the eye, and the book seems to be very much the tip of the iceberg of Snicket's upbringing: He hasn't lost his penchant for mystery and dragging us along one bread crumb of a hint at a time. It borders sometimes on forcing the mystery-and it will be curious how much the mysterious item in this chapter, the Bombinating Beast, will matter in the long haul, and if the barely seen villain-like presence will amount to anything. As always, he's teasing us and leaving a plethora of things open for the next book. We did get a ever-so-brief character reveal that fans of the series should be happy about, but I hope there's a little more connection in later volumes. The ride is full of the humor you would expect and enjoyable, but much like Snicket, you'll be asking yourself a lot of questions by the end. As frustrating as it is, that's always kind of been the point with the Snicket novels, and most likely, they'll all end up being the wrong ones anyways. It's a solid start that might not give fans the answers they were looking for, but opens up a whole new can of mysteries to devour. Willie Clark is a die hard Snicket fan: Recently he debated the subliminal effect that Snicket being a journalist may have had on his life's path. If you want to discuss V.F.D. ankle tattoo designs, send him a mysterious post card with the letter clipped from a magazine, or follow him on Twitter or Facebook.